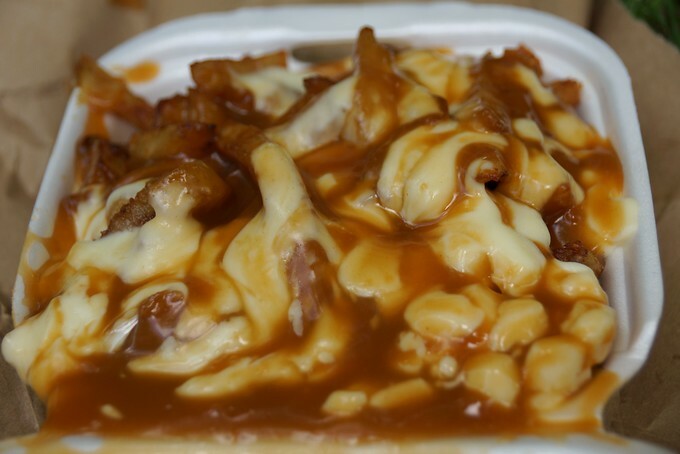 If you were to sit down and try to come up with the ultimate junk food that is the most unhealthy dish on the planet, you’d be hard pressed to top Poutine. 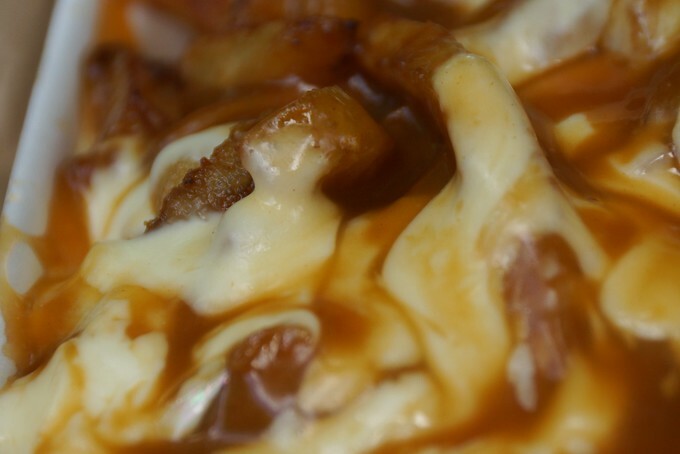 This Canadian dish, originating from Quebec, consists of fries smothered in cheese curds and topped with a generous heap of gravy. It looks disgusting. In terms of its nutritional value it is beyond disgusting. However, take one bite of it and you’ll likely be hooked. We both find it irresistibly delicious. Aside from the deep-fried Mars bar I tried in Edinburgh, Scotland, I’m not sure if I’ve ever eaten anything less redeeming than this French Canadian favorite. When deciding where to get our ‘sample poutine’ we did our homework. La Banquise, open 24/7, was a restaurant that consistently was mentioned online as one of the top places to eat poutine in Montreal. With over 25 different varieties to choose from it became a bit of a daunting task to narrow it down to just two. 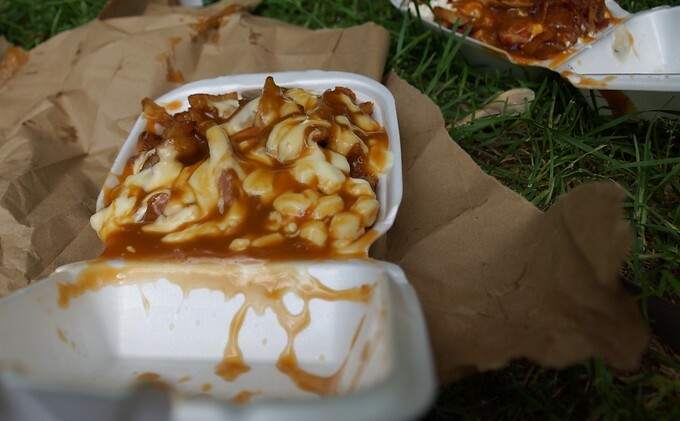 We couldn’t think of a better place to devour this sinfully delicious (yet equally regrettable) dish than a local park nearby our Montreal one week rental apartment. When pressed to decide which one we liked better (original versus premium) we both agreed that replacing the cheese curds with goat cheese and adding bacon for the win was an enhancement over the original. Maybe in the future if ‘grease’ is added as the 5th food category, we’ll consider eating this on more than just special occasions. How much does Poutine cost? The regular sized portions we purchased (which we quite generous in size) were just under seven Canadian dollars for the classic poutine and just over nine dollars for the premium one with bacon and goat cheese. Have you tried Poutine before? Is it something you’d consider sampling? What is the most unhealthy junk food you’ve ever eaten? Since I am Canadian born but have lived in the US since childhood, I felt it my patriotic duty to poutine in Quebec. Although I rarely eat food that junky I loved it. Went with the classic, brown gravy and curds that are large enough to squeek when you bite them. My 6 year old niece called them ‘mouse cheese’. Mmm poutine! As a Canadian, this makes me rather homesick for this delicious food. Good call on trying the classic, I find too often places screw up the simplicity of the poutine by adding too many toppings. Thanks for doing this amazing food justice! Thanks Mike! I agree with you about the original being hard to beat. I’ll try new ones but I find myself going back to the classic time and again. Monika & I were in Vancouver and saw a place that served up “Poutine”… I had to look twice to believe what I was looking at. Needless to say my insides are better for not going in, we settled for sushi instead. Ha! Yeah, it’s not the kind of meal you feel great about afterwards. Poutine done right is divine. And I think the goat cheese would be a good addition. Dunno about feta, though. I dont see it beating out good, regular cheese curds. Still, this was a mouthwatering post. Happy you liked it. Let me know next time you’re in Montreal! I love poutine! Here in Switzerland we have a restaurant chain which has poutine on their menu. I’m sure the original one in Canada is a bit different but it’s delicious. Nevertheless, I really would like to try the original poutine. Hopefully, I’ll be able to go to Canada in the next few years. Hey Sam! If you’re in Southern Thailand any soon, you can have a spectacular Poutine in a great restaurant/sport bar called Malibu Corner in Ao Nang, Krabi province. That’s where I tried it for the first time in my life and I was lost forever. It’s so horrificly good and addictive that you just stop caring about maintaining that beach body of yours after one bite. It’s worth it! Oh, and of course as it’s Thailand it’s also cheap, only 3 USD for a big plate. Yummmm! Wow- that looks like a heart attack in a dish and yummy! I’m off to Montreal this September- I’ll definately need to try this. Not sure whether to have the ‘regular’ or the ‘Jaco’ as Maxime suggests. Maybe I’ll need to try both for comparison sake ;-). Besides goat cheese and bacon are there other variations on this dish? Do I ever love poutine! I am from a small town just outside of Montreal and am now living in Dublin. I am going through actual with drawl symptoms of not getting my weekly allotment of curds and gravy. 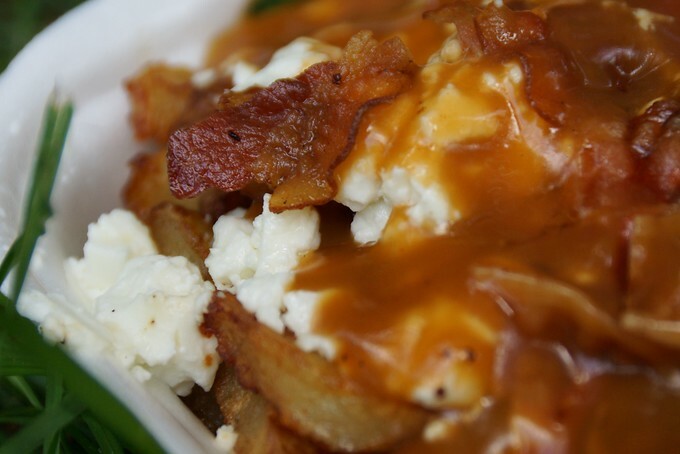 This post as giving me the drive today to recreate the magical Montreal poutine today. I think I might be adventurous and try to recreate a smoked meat poutine! I’ve heard of that before! I so want to try it. Most foods to be tasted properly need to be eaten in or near their area of origin. I’ve tried Tiramasu in Italy and France – DELICIOUS. I’ve tried it in New Zealand and Egypt. Nothing like it. When I lived in Montana I drove across the Canadian border to Lethbridge (Alberta) – a 6 hour drive – for ONE purpose… Poutine. I found the Red Dog Diner and loved it! Poutine is by far the food I crave most from Canada. It’s not like I had it regularly (since I’m pretty sure I’d be in for a heart attack before 30 if I had it more than once every month or two), but I miss having access to it. Feta or goat cheese are good substitutes, but it just isn’t quite the same without the cheese curds, which seem tough to find outside of Canada. Well that definitely looks messy and not attractive, but I’m sure quite yummy in a gross way. I’ve never tried it but definitely will when I’m in Montreal in the fall! Thanks for sharing. 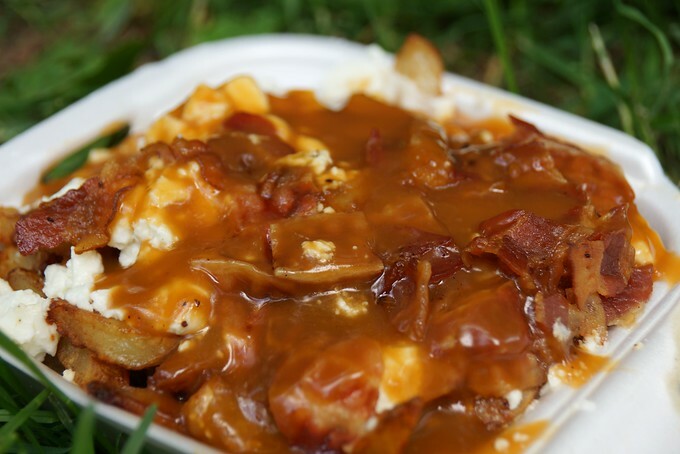 I have never tried poutine, it looks foul and would appear to be a heart attack waiting to happen, but … everyone raves about one taste and you are hooked. So, I am in and can’t wait to taste it. Love Poutine! I had my first helping in Banff and try to eat it where I see it now. I know a lot of people love it, but it was just too much for me. Sofie, you’re definitely not the only one who doesn’t like it. It’s terribly unhealthy and if you’re used to eating junk food it is a total shock to your system. I was in Montreal last year and tried the poutine at La Banquise and it was delicious. Wish I could go back there for some poutine right now, because I haven’t found a place in Edmonton that does poutine as good. 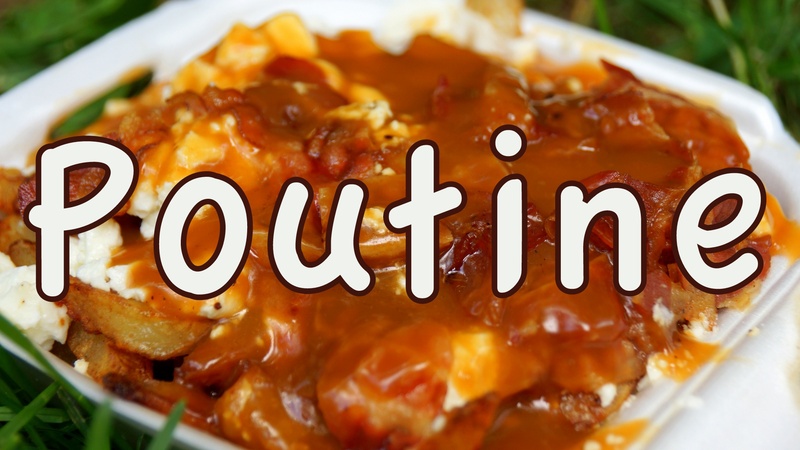 I know I’m probably in the minority here, but poutine looks and sounds disgusting. I lived in MTL for many years… You can’t go wrong with poutine at La Banquise, but next time, try one at Patati Patata (corner of Rachel and St. Laurent). It’s unbelievable!!! Smaller portion than those at La Banquise, but extremely good (and the black olive on top adds a nice little twist to the overall taste). That looks awesome Sam! I have yet to ever try poutine, but I’m looking forward to my first opportunity. Hey Sam, i’m from Montreal and La Banquise is a classic for me when i go out with my friends ! Next time i suggest you try the Jaco (steak, green pepper, mushrooms, onions and peppercorn sauce) or the Taquise, a fabulous guacamole poutine. Thank you for the recommendation! I think I’d love the Jacko 🙂 Did you say guacamole? I’m in! We’re going to miss Montreal a lot when we leave soon. It is our favorite city in Canada. Best wishes with your upcoming backpacking trip!